The guitar is notated on the treble clef, an octave higher than it actually sounds. The actual pitch of the notes played on the guitar begin at the bass clef and extend to the lower reaches of the treble clef. 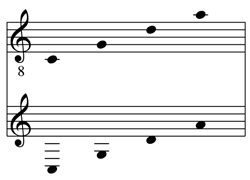 By notating the guitar an octave higher than it sounds, the notes are all on the treble clef and easier to read. Starting in the 18th century treble clef has been used for transposing instruments that sound an octave lower, such as the guitar. An eight below a treble clef lowers the pitch range by one octave.